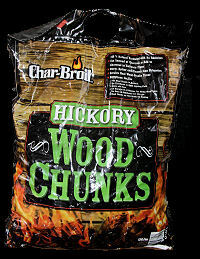 Our goal in this report was to gather and share information about hickory wood chunks, as opposed to doing any sort of review like we do for lump charcoal. We obtained products from 8 different sources and thought we'd share our observations with you. We don't claim any expert knowledge on this topic, but we wanted to make available the observations that popped into our heads, and thus we'll try to make our conclusions general in nature. We hope that this information is useful to you. And we should mention that thanks for the idea for this report goes out to Jeff at Smoke in the Ozarks, who sent us a sample and asked us to do some sort of product review. As far as "testing" goes, essentially we just did the things that popped into our head. As is our wont, we dumped the contents of each bag or box out for inspection and photographing. We photographed the entire contents overall, a closeup, any interesting pieces and then the pile of stuff that wasn't chunks of hickory. Since these are supposed to be chunks, we didn't include chips in the usable weight. We also didn't include loose pieces of bark in the usable weight since most folks we know don't want to use only bark for smoking. While most people don't object to bark's presence on the chunks, they wouldn't use bark alone. The next thing we did was to measure the moisture content of the wood. This was done by weighing a sample of each brand, heating the samples in the oven at 275 degrees until the samples stop dropping in weight. The moisture content is then expressed as the percentage of the weight loss to the original weight of the sample. Our last test was to place a piece of each brand on burning charcoal in order to produce smoke so as to compare the smoke produced by each. In selecting the chunk for this test, we did what we think the average person would do and chose a good looking chunk, versus some of the semi-rotted or stained pieces that we found in some of the brands. One final thing before we get on to the list of hickory chunks. Spalting. We will be using this word in our observations and we think it is important to know what it is. 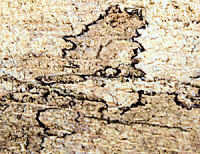 You can read about it at Wikipedia, but briefly, spalting is decay that is the result of invasion of the wood by fungi. Discoloration occurs as the fungi "bleach" the wood by consuming lignin. Dark lines form as areas of competing different fungi erect barriers to protect their territory. In the photo at right, you can see the dark lines and the regions of differing color in a piece of spalted hickory. As the decay proceeds, the wood loses strength and weight. "The dust created from sanding and sawing spalted wood has a toxic nature about it and has a reputation for causing respiratory problems. More specifically the mold or fungi that causes spalting to occur is what triggers the asthma like reactions that can be severe." "Spalted wood can also contain claustridius, the bacteria responsible for botulism. The best defense is to have a good dust extractions system and to wear a dust mask when working with spalted or any other kind of wood." It is important to note that mold spores are not destroyed by the temperatures found in a smoker. So if you are susceptible to mold or fungus allergies, you would probably do well to discard any spalted wood rather than use it for smoking. "...the interlocked phenolic rings of lignin break apart from each other into a host of smaller, volatile phenolics and other fragments, which have the specific aromas of vanilla and clove as well as a generic spiciness, sweetness, and pungency." So clearly, the character of the smoke produced by spalted wood will be different than that produced from wood which has not rotted and decomposed. So, we feel it is best to just avoid spalted wood altogether. The top three were purchased over the internet, while the bottom five were purchased from local stores. Char-Broil looked more like hickory than the lower quality "store-bought" brands. A few pieces looked like they might have had some mold on them, a few were somewhat decomposed, however there were no spalted pieces. A few pieces were large enough to require splitting for use by the average backyard cooker. 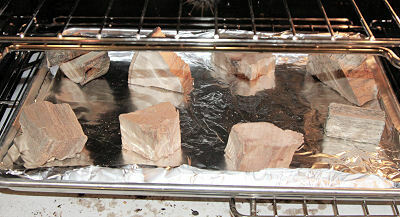 When removed from the oven after drying, the Char-Broil hickory had a mild smell of smoking hickory and a slight carmelized or toasty sort of smell. When heated to smoking temperatures the chunk had a smell that was not unpleasant, but not the smell of hickory smoke. The smell was a little musty. 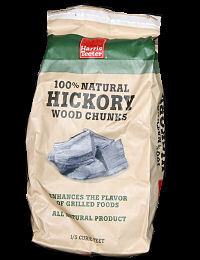 Harris Teeter chunks come from Nature's Grilling and reflect their usual high standards. With very little waste in the bag, the chunks were good sized, clean and looked like hickory. There were no spalted pieces. The only minor problem (depending on your point of view) might be that a couple of the pieces had a large amount of thick bark attached. Some folks don't like bark, but most don't mind. Of course, a quick blow with a hammer and dull chisel would take care of it. But no mold, no dirt, all in all good quality chunks of wood. When heated in the oven, the chunks had a mild smell of smoking hickory. When heated to smoking temperatures the chunk had the smell of good hickory smoke. No off smells or mustiness. We have never been big fans of Western Woods or their products and their wood chunks are no exception. The bag contained a few spalted pieces, while about 1/3 of the bag had started to decompose and were questionable. These pieces were light and soft, clearly not healthy pieces of hickory. Only 3 pieces were really the color of hickory. Some pieces had a darkened or stained end grain. When heated in the oven, there was no smell of smoking hickory, but curiously the chunks had a sort of spicey smell reminiscent of a middle Eastern spice mix. When heated to smoking temperatures the chunk did not smell of hickory, but rather of some other sort of off smell that was similar to a moldy smell. Cowboy chunks contained a lot of stained pieces. One piece looked like it had a rust stain. Others looked like mold or mildew. Two pieces appeared to be spalted. A few of the pieces were large enough to require further splitting. When heated in the oven, the pieces did not smell of smoking hickory. They actually smelled musty and not very nice at all. When heated to smoking temperatures, the chunk smelled of hickory, but with the slightest bit of mustiness. 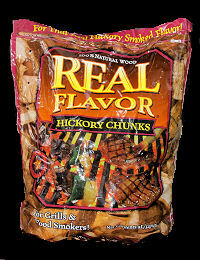 About 1/4 of the Real Flavor chunks were moldy or mildewed. There were several large pieces that might require splitting. 3 pieces had started to decompose and were soft and light weight. None of the wood pieces looked like nice clean hickory. It all looked pretty dirty as if it had been sitting outside for a long time. When heated in the oven, the chunks did not smell of smoking hickory but instead had a medium-strenght off smell, again, not pleasant. Another brand that when heated to smoking temperatures had a smell that wasn't unpleasant, but not the sweet smell of hickory. There was some mustiness to the smell. 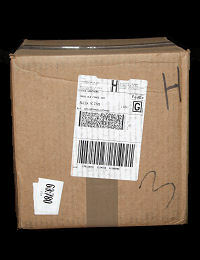 Note the "H" on the upper right-hand side of the box. 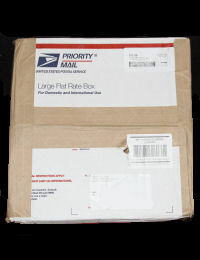 If you order multiple types of wood, each will arrive in a separate box, and the box will be marked with a letter to identify the type of wood. The box contained beautiful beautiful chunks of hickory with almost no waste. The wood looked exactly like hickory should look. While the pieces were on the small side, it's a lot easier to put two pieces on your fire than it is to have to split a big pieces to get one small enough. Simply beautiful hickory chunks that smelled like smoking hickory when heated in the oven. When heated to smoking temperatures the chunk had the smell of good hickory smoke. No off smells or mustiness. Again, a box of beautiful beautiful hickory chunks. These chunks were on the large side, but easily split if necessary. There was virtually no waste in the box. When heated in the oven, these chunks smelled like smoking hickory. When heated to smoking temperatures the chunk had the smell of good hickory smoke. No off smells or mustiness. Smoke in the Ozarks premium chunks are 4" long and about 1 to 1.5 inches in diameter. These are intended to be quite uniform in size to produce a uniform smoke when cooking. 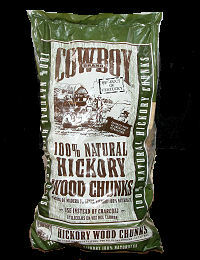 Virtually no waste in the box, just good quality hickory chunks. All bark has been removed for the premium grade. When heated in the oven, they actually had very little smell. When heated to smoking temperatures the chunk had the smell of good hickory smoke. No off smells or mustiness. Smoke in the Ozarks also has two other grades available, a middle grade with some tight bark, and a lower grade of oddball chunks. These two grades are less expensive than the premium grade. 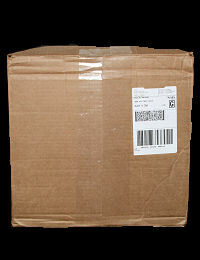 All their prices include the shipping. The three "internet" brands (Hawgeyes, Chigger Creek, Smoke in the Ozarks Premium) and Harris Teeter (Nature's Grilling) were the best. They all contained virtually no waste and were nice dense clean pieces of hickory. They smoked with the clean sweet smell of hickory that you would have expected. When we placed the chunks on the burning charcoal, you smell that hickory smoke smell even before you started to see the smoke. The other four brands were not nearly as good and they were a mixed bag. While Cowboy looked bad from the bag, if you picked out the good pieces, the smoke did resemble the smell of hickory, with just a touch of mustiness. Char-Broil, looked pretty good out of the bag, but the smell of the smoke just wasn't what you would expect from good hickory chunks. Real Flavor didn't look as good out of the bag, and the smoke resembled that of Char-Broil, not unpleasant, but not the sweet smell of hickory and with a fair amount of mustiness. At at the bottom, Western Cookin Chunks smelled like mold when smoked. Note: Density was approximated only for brands sold by volume and using the advertised volume. Density was adjusted for moisture content. So, it looks like in general you get what you pay for. The surprise of the lot is probably Harris Teeter which was right in the middle, price-wise, of the five store-bought brands yet was up there in quality with the other three "internet" brands. We would eagerly recommmend any of the top four brands. We have reservations about Cowboy, Real Flavor and Char-Broil since you don't get good hickory smoke and much of the contents of the bag would go to waste. 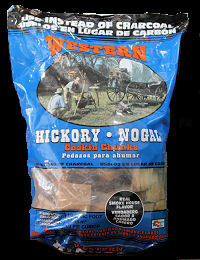 We would not recommend Western chunks due to the frankly unpleasant smell of the smoke.